Cognitive / The magnificent benefits of music! The magnificent benefits of music! Recent research using fMRI and PET scan technology have found that listening to music lights up multiple areas of the brain as sound was processed, and all this happens in a matter of seconds. Further research has revealed that playing music takes the brain a step further, stimulating a full body workout for the brain. Now, teaching babies or toddlers to formally play instruments is not developmentally appropriate, but that doesn’t mean that they can not engage or benefit from music. On the contrary, listening to people sing, play with everyday objects or toys to create sounds, and sing and dance with caregivers are wonderful for your little one’s brain development. During the first three years of your child’s life, neural connections form at their fastest rates. Exposure to music in early childhood fosters and helps develop many skills including speech development, audition, coordination, emotional development, and even social skills. Below are some of the ways of how music benefits this rapid development and growth, and a few activities to try at home. Music promotes bonding: Your baby loves your voice the best, therefore singing to your infant is a great way to develop a secure attachment through serve-and-return interactions. Incorporate your little one’s coos, gurgles, and babbles into a song and have back and forth interactions together. If your child is older, continue singing and incorporate playing a toy instrument or even pots and pans together by taking turns. Music reduces distress: A recent study revealed that singing to your baby instead of speaking delays distress. The researchers believe that using infant-directed singing is beneficial because of the predictable beat, metrical organization, and tempo that helps promote entertainment, predictive listening, and expectations for subsequent events. What’s more, rhythm found in singing and music affects vestibular stimulation, and when both singing and rocking are together, they work as potent emotional regulators. Music teaches social skills: Playing with homemade or toy instruments requires your little one to develop listening and turn-taking skills to create a harmonious and pleasing sound. With the help of caring caregivers, making music helps build the foundation for the development of executive function skills. 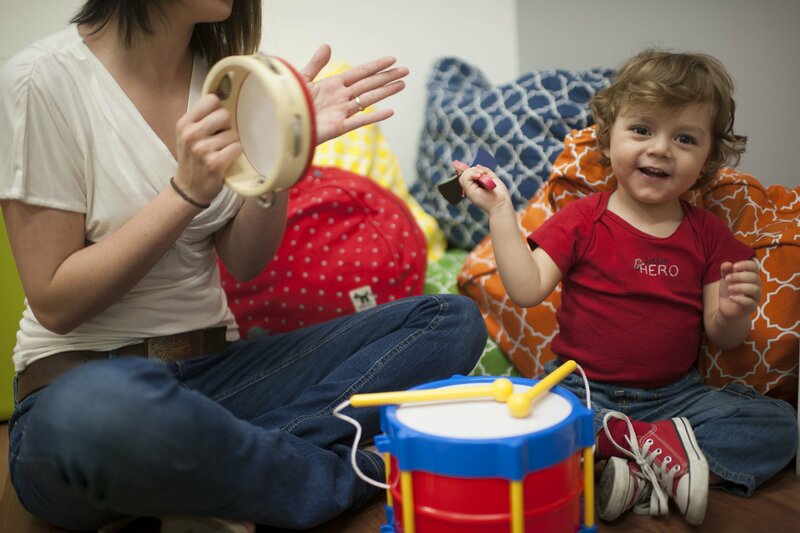 Music allows for artistic expression and creativity: Playing with musical items helps your little one foster creativity, express his emotions freely, and develop his senses while discovering new ways to make sounds. Music helps babies feel secure: Using repetitive and specific songs during your infant’s routine helps him identify what comes next, making his day predictable and therefore stress-free. Music helps develop language: Singing lights up the language areas of the brain as one identifies the words spoken. In addition, thanks to a song’s repetitive design, listening to words over and over reinforces the acquisition of new vocabulary. Musical environments stimulate musical skills: When infants and toddlers are exposed to music during early development, they develop skills such as singing on pitch or dancing to a rhythm early on. Music is play: Listening to music, dancing, and singing should not be a chore, it should be a free and fun way to develop skills such as language, motor skills, and coordination. During these early years of development, musical skills are just blooming. This period of growth is a prime time to explore your child’s natural musical spontaneity, while encouraging his natural inclinations to sing, move, and play with sound. Dance with your baby while singing and use specific words to different movements to develop language, rhythm, and balance. Carry your baby and move around the room to a beat, or dance in front of a mirror with your little one to teach self-awareness, spend time together, and encourage musical skills. Teach your little one to use his body as a musical instrument by clapping and stomping to a beat, or use everyday objects to create sounds and learn about cause and effect. Note: for babies, gently tap on their backs to the music providing gentle touch and teaching them concepts of beat, rhythm, and even tempo. Teach your little one songs that include moving to particular actions and show your little one how to dance along. Moving according to the song will teach him coordination, body awareness, and rhythm. Play stop and go games with your toddler. Play some music and dance around, but when the music stops, freeze! When the music starts again, he’s free to move around again. This is great for fostering executive function skills. Sing to your little one during bath time, bedtime, or during any other activity to have a soothing experience and, at the same time, emphasize predictability. Make music together. Use Kinedu to stimulate your baby’s musical abilities. Do the following activity with your child and be sure to visit the catalog section of the app to find more activities that promote musical development. During the first 3 years of your child’s life, neural connections form at their fastest rates. Exposure to music in early childhood fosters and helps develop many skills including speech development, listening skills, coordination, emotional development and even social skills.